HAVING made a victorious racing return at Albion Park last night, rising star Colt Thirty One will be readied for his Grand Circuit debut during the next couple of months. Completing a clean sweep of the Qbred Finals with his triumph in the four-year-old division, Colt Thirty One has been aimed at Queensland’s Winter Carnival by trainer Grant Dixon. Along with the age-group features Dixon has set his sights on The Blacks A Fake on July 20, which doubles as the last leg of this season’s Grand Circuit. “I’m setting him for the Carnival,” Dixon said. “I like to think he can race in the main events against the better horses that may come up. “It will be a good opportunity to test him at a higher level without having to travel. Driven by Dixon during his latest win, Colt Thirty One settled midfield early from his second row draw before being sent forward to test the leader, Pin Up Boy, from the breeze. Dashing the front at the top of the home stretch, the son of Mach Three completed a three-and-a-half metre win from the pacemaker, with Corey William two metres away third. 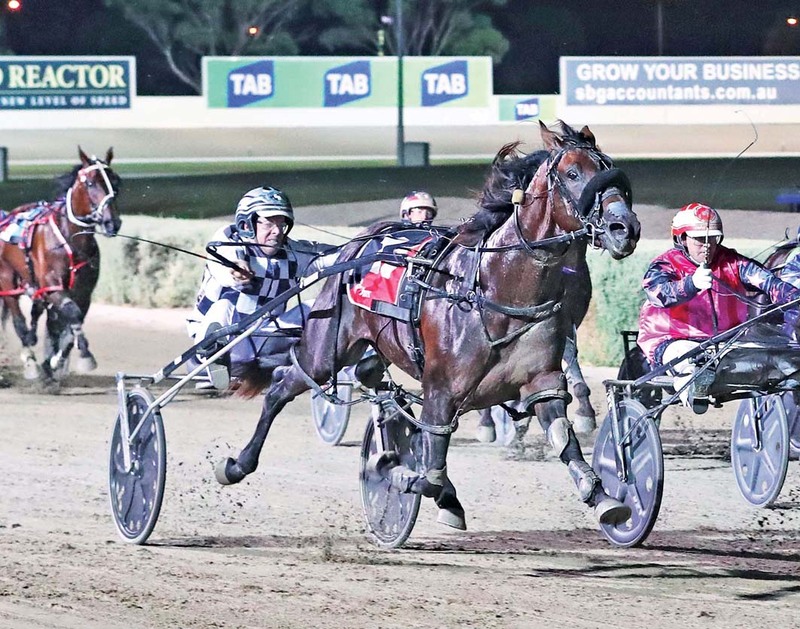 Bred and owned by Kevin and Kaye Seymour, Colt Thirty One took his record to 24 wins and seven placings from 26 starts by rating 1:55.7 over 2138 metres. Colt Thirty One’s win was the middle leg of a training treble for Dixon, who combined with reinsman Luke McCarthy for a feature double. The pair opened the night on a high when Miss Moneybags outstayed her rivals in the Three-Year-Old Fillies’ Consolation. Also by Mach Three and owned by the Seymours, Miss Moneybags rated 1:57.2 over 2138 metres. “The race was run to suit her and Luke drove her a treat,” Dixon said. “I haven’t got much in mind for her at this stage, just keep poking along. Dixon and McCarthy then scored with Red Charmer, which proved too good in the Four-Year-Old Mares’ Final. Rating 1:56.5, Red Charmer accounted for the Chantal Turpin-trained stablemates Happy Feelings and Torque Feels Good to give Mr Felgood a siring trifecta.